Imagine relaxing on a Saturday morning in a charming Waldport cottage while gazing out at the blue landscape of the Pacific Ocean. This lovely retreat, one of the charming beachfront Cape Cod Cottages will make your vacation dreams come true - as you'll have just about everything you need for a simple, yet peaceful vacation. 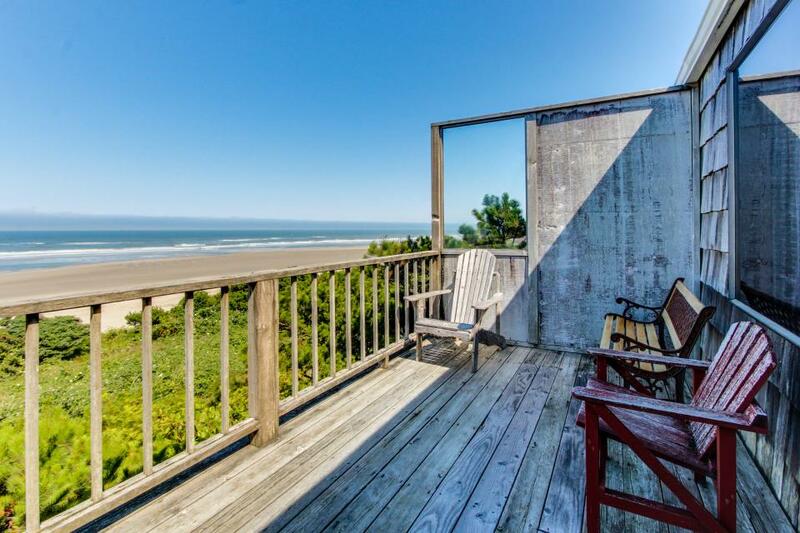 Waldport is known for its miles of unspoiled beaches, and this cottage is located right on the gorgeous Big Stump Beach - known for its mysterious redwood stump that was once part of a forest before the beach ever existed. You'll be within walking distance to this strange landmark, but you'll also be able to wander the shores finding the perfect spot for crabbing, fishing, or clamming. You may even catch sight of a whale or two passing through! All on one floor, this one bedroom vacation rental is easy to get around in, so its perfect for those travelers who have difficulty with stairs. The living room has a big picture window facing oceanward and glass sliding doors leading to a deck. Watch your favorite cable show on the flatscreen TV or bring some DVDs for a movie night. You'll even have WiFi for staying on task with work emails. The kitchen has a little eating space with room for four, as well as everything you'll need to create delicious breakfasts or hearty dinners. The master bedroom has a comfortable queen-sized bed making it easy to drift away in sleep each night. In addition, there's a full bathroom. Along with the sofa bed in the living room, this home can comfortably sleep four guests plus two dogs, for a $10 per night per pet fee (with a $40 minimum charge per stay). No need to continue searching around for the perfect vacation rental, when this Cape Cod Cottage awaits. Whether you are eager to book your yearly beach getaway, or you're looking for a last minute weekend trip to the coast, this rental will suit your family. Make your escape from the everyday and reserve this charming home before it's too late!